Microtubules display an orientation parallel to the long axis of the axon making them ideal candidates for transport over long distances. In contrast, actin filaments in axons are primarily concentrated adjacent to the plasma membrane and have unknown orientations with respect to polarity. Remarkably, some actin filaments do associate closely with microtubules. Electron microscopy has shown that actin filaments can be interwoven with the longitudinal bundles of microtubules34, however, it remains unclear whether this association plays a role in transport or is rather essential for maintaining the structural integrity of the microtubule bundles. It has been suggested in this respect that myosin I is likely to contribute to local transport in axons and might help that transported vesicles dissociate from the long-distance transport traffic and traverse the actin-rich cortex adjacent to the plasma membrane10. 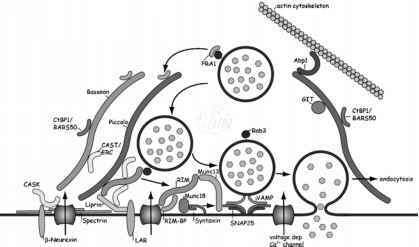 Myosin Va associates with axonal organelles that contain synaptic vesicle proteins35-37 and that are transported along microtubules in axons38. In the absence of myosin Va activity their transport rate increases, indicating that these organelles associate with both types, microtubule-based and actin filament-based transport motors. Indeed, myosin Va has been shown to interact directly with the kinesin motor KhcU39 and the movement of myosin Va-labeled vesicles in axons is partially microtubule dependent. These observations raise the possibility that a dual motor complex regulates certain vesicle movements along both microtubules and actin filaments38,39.